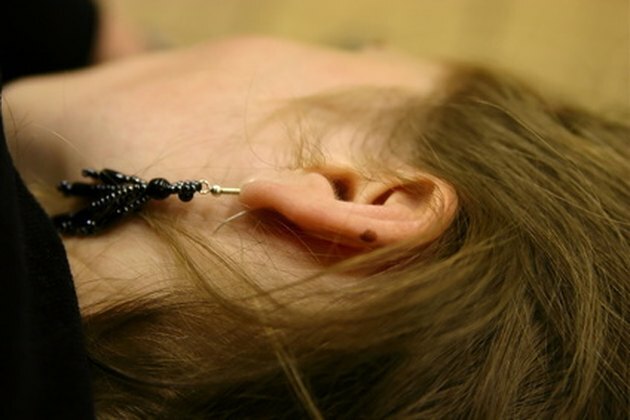 Earaches can affect people of any age. Children often suffer earaches stemming from infections because of an accumulation of too much water from a day in the pool. No matter the age or the cause, earaches are always unpleasant. A common method of relief is the use of hydrogen peroxide. In many cases, if used correctly, hydrogen peroxide can help to soothe a painful earache. Fill a syringe with 3 percent hydrogen peroxide. A bulb syringe works well for this task. Insert anywhere from five to 10 drops of the hydrogen peroxide into the ear that is suffering from the earache. Lie down on your side so that the ear with the peroxide in it is facing up. You will hear bubbling and fizzing as the peroxide sits in your ear. Allow the peroxide to stay in your ear for at least 10 minutes. Stand up and hold your ear over the sink to drain it out. Keep a clean cloth handy to wipe up any peroxide that gets onto you and anywhere other than the sink. Rinse your ear by filling the syringe with clean water and spraying it into your ear or by standing in the shower and holding your ear under the water. If the earache persists and cannot be soothed, talk to a doctor about possible causes and potential treatments for it.